6 min read ✭ These ten digital marketing tactics are designed to help museum, symphony and theater professionals increase their online ticket sales. Read and see how Facebook, Google, and Conversion Design can benefit your organization! Whether it’s for a new exhibit at the museum, an upcoming musical at the theater or a classic recital at the symphony, every museum, theater and symphony wants to sell more tickets. Here are the top 10 digital tactics every organization looking to increase their ticket sales must test! Facebook and Instagram are great avenues to work with when trying to hyper-target an audience. Thanks to smart technology and innovative algorithms aiding in hyper-targeted custom audiences, remarketing to users who’ve abandoned their shopping cart, or creating lookalike audiences of new supporters, these social platforms have paved the way for enhanced marketing strategies that will blow ticket sales out of the water. If your organization typically collects people’s first name, last name and email address as they purchase tickets for an event, make sure to create and save a CSV of this information. Why? Because you can create a target custom audience on Facebook and Instagram simply by uploading a list of past attendees. In order to do this effectively, upload the specs into your Facebook Business Manager and allow Facebook (and Instagram) to find as many matches to these particular profiles as it can. Once social profiles have been matched with the information provided, the Facebook and Instagram platforms will let you run ads targeting these specific individuals. Targeting people who have already attended an event in the past is a great way to promote upcoming events and ensure a higher chance of generating conversions. Assuming past attendees had a positive experience the first time around, it is more likely that the people who have already attended one of your shows, performances or exhibits will be interested in attending more. Keep things fresh while keeping your target audience up-to-date by highlighting any new exhibits, plays or performances that may be coming up. Another hyper-targeted marketing strategy to implement on Facebook is Website Retargeting. By placing a Facebook pixel on your website, Facebook algorithms are able to then gather data around an instrumental audience to target: people who have shown interest in purchasing a ticket onsite, but have abandoned their shopping cart. Within this remarketing tactic, you can further customize your ad strategy. You have the ability to target all individuals who visit your general website, or, you can scope out the people who have just hit key pages onsite. Implementing the use of a Facebook pixel on your organization’s website is highly recommended, as it allows you to recover any potential lost customers. So, be sure to target this audience and encourage them to complete their ticket purchase – as most people just need a quick reminder to do so! Avoid running ads to merely anybody and everybody in your area when looking to attract a new audience. Rather, be strategic in your marketing approach and target a demographic who is likely to be interested in your shows, performances and exhibits right off the bat. Within the Facebook Business Manager, you have the opportunity to build lookalike audiences targeting new people based off the characteristics of people who already support you. Amazingly innovative, right? Rather than guessing who your interest audience could be, you can target new supporters based off the exact behaviors, characteristics and overall trends of the people who currently purchase tickets to your events. Use lookalike audiences to create a target demographic that matcher either your past event attendees, your website visitors or even people who are fans of and actively engage with your organization’s Facebook page. Utilizing lookalike audiences is one of the best ways you can find new people to target in your area while maintaining a very low Cost Per Acquisition, or CPA. If you are unsure who to effectively target within a very large audience, the best strategic approach is to create a marketing funnel on Facebook. To properly do this, start by creating a short video, between 30 to 120 seconds, highlighting any upcoming event, exhibit or performance your business might be showcasing. Then, run the video within a Brand Awareness or Reach campaign on Facebook. After that campaign has run for enough time that you have been able to gather effective data, create another ad campaign targeting all the individuals who watched over fifty (50%) percent of your video from your initial campaign. Make sure this second campaign goal is marked by Conversions. By creating a marketing funnel, you can target a much broader audience while utilizing your ability to hone in on the people who will be most likely to convert and purchase tickets to your upcoming event. This way, your marketing strategy will be much more streamlined in addition to the fact that you are able to allocate ad spend more efficiently within your marketing efforts. Email can be used for much more than just one-off sends and weekly newsletters. With strategic email marketing automations, you can ensure consistent, high-quality and data-driven communications to be delivered across your organization’s subscriber list. More specifically, implementing a Welcome Series and a Transformation Automation within your email marketing strategy will help yield traction and drive ticket sales. Create a Welcome Series for your new subscribers and keep in mind that it is your organization’s first impression to this fresh audience. The welcome series is a simple, yet informative, automation sending subscribers three to four emails over a one to two week period. Greet them with focused, value-driven content that educates them on the purpose of your organization. This is where you help your newest subscribers understand why they should be excited about any of your upcoming events, or your organization as a whole. Many email platforms allow you to segment your email list based on how readers may have interacted with an email. In your third or fourth email send, ask subscribers a question that will ultimately help you to follow up more effectively in the future. For example, a performing arts theater might create an email send within their Welcome Series asking subscribers what types of shows they like, providing a few different examples to choose from. If some subscribers express interest in musicals while others prefer tragedies, then you can segment your email lists to separate the people who want to hear about upcoming musicals from the people who would want to attend tragedies. This way, you can ensure that each point of communication you have with your email subscribers is relevant and most likely to lead to a conversion, or ticket sale. While we are on the topic of tragedies, one of the biggest email marketing mistakes we see organizations struggle with is emailing their subscribers about everything. By not segmenting an email list and not tailoring each email send to be relevant to your subscribers’ interests, readers will lose interest and start to tune you out. Transformation Automations are another advanced email tactic that all organizations must be testing. These types of automations are designed to come after the Welcome Series, and are focused on trying to convert your newest subscribers via email. 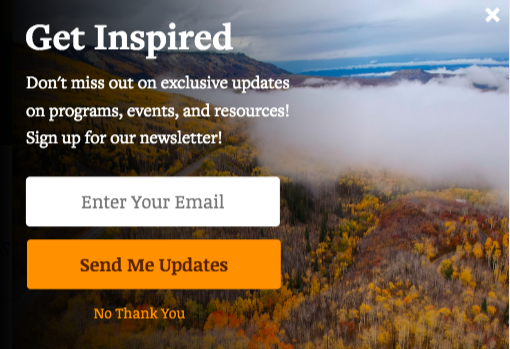 Transformation Automations are another set of three to four automated emails that help sell your readers on attending one of your events for the first time. An important tactic to consider when creating Transformation Email Automations is to think about the factors that may play a role in your subscribers’ decision making processes. Think about what questions, concerns or hesitations they might take into account when deciding whether or not to visit your museum, see a show at your theater or listen to your orchestra play at the symphony. Address these questions and be sure to leave your subscribers wanting more in person by not leaving them in the dark online. Creating this type of automation path will help reassure your new audience while creating consistent communication across the board. Not to mention, it helps keep your organization top of mind. Google offers eligible 501(c)(3)’s $10,000 per month in free, in-kind advertising credit on its Search Ads Platform. While navigating through the Google Ad Grant account stipulations may be tricky at times, Community Boost’s museum, theater and symphony partners have seen much success in increased ticket sales on the platform over the years. The next digital tactic we think each organization must test is one that we have seen provide great results for some of our event-based partners! All of the museums, symphonies and theaters we are lucky to work with have been able to strategically leverage their Google Ad Grant to increase ticket sales to different audiences with one common goal: they are looking for things to do! While there are many different ways to approach creating campaigns, ads and keywords, one that we love to test is the “Things To Do” campaign. It is no secret that people rely on Google. Millions of people conduct searches on Google each day, and a great chunk of them are looking for something new and exciting to do. We have seen increasingly high search volumes around keywords prompting activity ideas, like things to do, and things to do in <city name>, or things to do near me, etc. By utilizing the Ad Grant on Google’s Search platform, businesses can put a variety of activities on people’s radars. Visiting the local history museum, and going to the symphony or watching a play at the theater are already fun pastimes on their own – so, creating a “Things To Do” campaign merely just reminds people of the availability of these activities. Though it’s not targeting “Things To Do” keywords specifically, branded campaigns can bring in searches from people who are interested in your subject matter, yet are unaware of your actual event. i.e. people searching for the “Hamilton soundtrack” but coming across an advertisement to buy tickets to the musical at a theater near them. While the effectiveness of branded search certainly depends on the popularity of the name, branded campaigns are a great way to drive ticket sales by connecting with a mission-aligned audience. Another way to advertise on the Google platform is with a Paid Ads Account. While a paid account requires funding out-of-pocket, paid ads can be leveraged if you want to take advantage of remarketing on the Google platform. Similar to Facebook’s pixel retargeting, Display Remarketing Ads are an extremely cost-effective way for an organization to target an audience whose interested has already been piqued. Display Remarketing Ads on the Paid Google Ads platform are great when used in conjunction with other search campaigns. Display remarketing ads allow you to retarget to your website visitors by running a visual banner ad that will follow them around the web as they browse on a variety of other websites. These types of remarketing ads help you stay top of mind, as individuals are constantly reminded of your organization. Also, display remarketing ads can generally help you increase the conversion rate between the number website visitors and the amount of tickets sold; it can be a great platform to help generate small boosts in sales. Remarketing Lists for Search Ads, or RLSA, are a great way to target warm leads, or an audience that has already expressed interest in what your business has to offer. Similarly to how the Facebook pixel operates for its own platform, RLSA can target people who have yet to complete their purchase onsite, encouraging to finish what they started. Understand how a Paid Ad and the Google Ad Grant differ, read our post about the Key Differences Between A Google Ad Grant and Paid Ads. Every organization should be using some form of onsite conversion design to help generate new email subscribers, donations, and sales. Below we will explain two types of conversion design element we test with every museum, theatre, and symphony that we work with. Another tactic to avoid a potential lost sale, Exit Intent Pop-ups are a conversion design tool that can be used during the checkout process. If a site visitor tries to leave the checkout page prior to completing their purchase, a small pop-up will appear as they try to exit. These pop-ups are meant to keep people onsite, either by claiming a limited amount of tickets left or by offering a small discount code to encourage following through with the purchase. Onsite conversion design elements like exit pop-ups are easy to create and help recover a great amount of potential lost revenue. In addition to Exit Pop-ups, Scroll Boxes have proven to be a useful conversion design tool used for more than just building an email list. Scroll Boxes can be used to offer discount codes to first time visitors, inform people on a show that is selling out, promote an exhibit that might be ending soon, etc. A game-changing quality of Scroll Boxes is that these elements can be customized to solely target users with a specific set of behaviors, such as time spent on site, how they were redirected to the site, or how far down a page they have read. Learn more about the importance of conversion design elements like Smart Bars, Scroll Boxes and Exit Intent Pop-ups from our Intro to Conversion Design.